Obstructive sleep apnea syndrome (OSAS) is common in children with craniofacial anomalies, particularly in children with syndromal craniofacial synostosis associated with midfacial hypoplasia, micrognathia, muscular hypotonia, brain stem compression (achondroplasia), and/or deformation of the cranial base. These anomalies lead to a decrease in the size of the nasopharynx, oropharynx, or hypopharynx and can predispose the pharynx to collapse during sleep. Increased airway resistance secondary to adenotonsillar hypertrophy is the leading cause of secondary OSAS in these children. 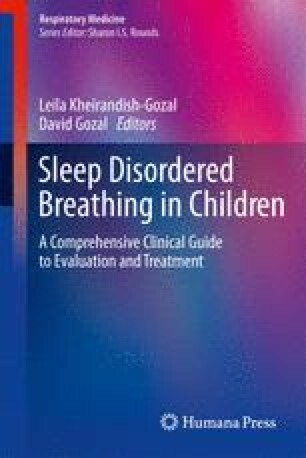 This chapter discusses the anatomy and dynamic characteristics of the upper airway during sleep to aid the understanding of sleep apnea syndrome.